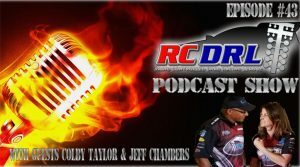 In this episode of the RCDRL Podcast Show, hosts Heather Bowman and Michael Mercadel discuss the Shipman Snack Service Nationals, the Mothers Day bonus race, and the delayed Cinco de Mayo Nationals. They also welcome the newest Young Gunner winner Colby Taylor and RCDRL official Jeff Chambers to the studio for a Q & A session. Mix in some Rockstar Powder Coat US Super Nationals talk and some important tech tips and we are on our way to episode #43! So sit back relax and enjoy today’s show!